Rocky is a 1976 film written by and starring Sylvester Stallone and directed by John G. Avildsen. It tells the rags-to-riches American Dream story of Rocky Balboa, a dim-witted but good-hearted debt collector for a loan shark in Philadelphia. Balboa is also a professional boxer who gets a shot at the world heavyweight title due to contender Mack Lee Green breaking his hand and being unable to fight. 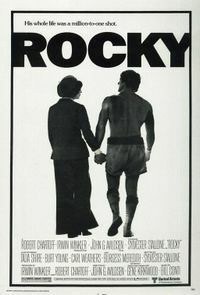 After this film, films with similar storylines (especially sports films) would often be compared to or described as "Rocky" films. Also starring in Rocky are Talia Shire as Adrian, Burt Young as Adrian's brother, Paulie, Burgess Meredith as Mickey Goldmill, Rocky's trainer, and Carl Weathers as the champ, Apollo Creed. The film, made for only $1.2million, and shot relatively fast in 28 days, was a sleeper hit; it made over US $117.2 million, won three Oscars, including Best Picture, and garnered mostly positive reviews which helped to launch Stallone's career. It spawned five sequels, Rocky II, III, IV, V and Rocky Balboa (released on December 20th, 2006). Rocky Balboa is introduced as an enforcer for a loan shark who boxes on the side. The World Heavyweight Championship bout is scheduled for New Year's Day 1976, the year of the United States Bicentennial. When the opponent of undefeated heavyweight champion Apollo Creed is injured, Creed comes up with the idea of fighting a local Philadelphia underdog and, because he is known as "The Italian Stallion," Creed selects Rocky. To prepare for the fight, Rocky trains with 1920s-era ex-bantamweight fighter Mickey Goldmill, while Rocky's best friend Paulie, a meat-packing plant worker, lets him practice his punches on the carcasses hanging in the freezers. During training, Rocky courts Paulie's quiet sister, Adrian. The night before the fight, Rocky confides in Adrian that he does not expect to beat Creed, and that all he wants is to last 15 rounds (the typical scheduled length of championship fights at the time). Creed does not take the fight seriously, but this changes when Rocky surprisingly knocks down Apollo early in the first round. The fight indeed lasts 15 rounds with each fighter being severely injured. When Rocky is being interviewed after the fight, he calls out for Adrian, who runs down to the ring. As Creed is declared the winner by split decision, Adrian and Rocky embrace, and she tells him she loves him.